If it's your first or second trip to New York City, it can be pretty overwhelming when you try to choose among all the enticing attractions beckoning you to check them out. It's not called the Big Apple for nothing: New York City the center of the worlds of finance, fashion, music, art, theater, literature, and architecture. And it is the scene of lots of history as a bonus. You just can't see it all in one trip. To get a feel for the city, start with this list of its top attractions and landmarks. Many of the attractions on this list are iconic NYC institutions and could very well be on your bucket list. So get ready to check a few off and get a feel for one of the greatest cities on the planet. These picks are in no particular order; they're all top-of-the-list spots. 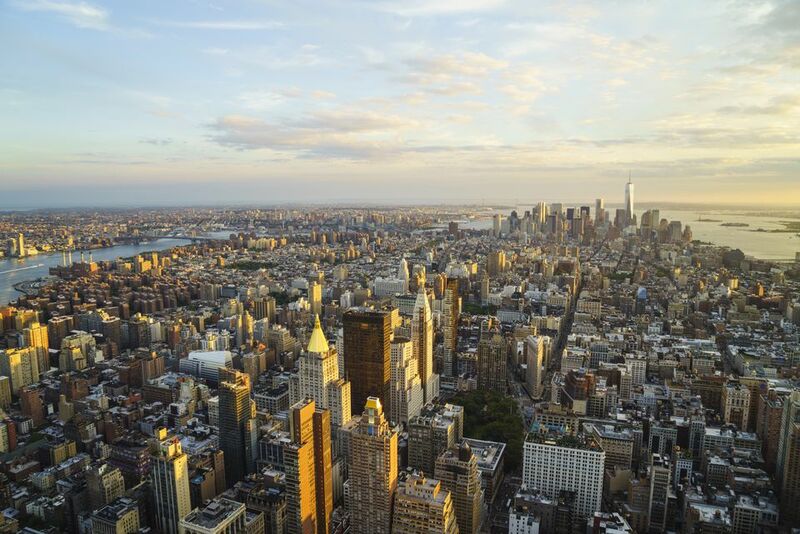 If you have some time after visiting these landmarks, check out Greenwich Village and Washington Square Park, shop on Fifth Avenue, ride to the top of One World Observatory, take a walk on the High Line, and go bar-hopping in the Meatpacking District. The Statue of Liberty was a gift to the United States in 1886 from France in honor of the friendship established between the newly minted United States of America and France during the French Revolution. It has become an American symbol of freedom and welcome to the immigrants who come to the United States looking for a better life. Only visitors who are in good health and plan in advance visit the crown of the Statue of Liberty because tickets are limited to allow roughly 240 people per day crown access. Even if you can't visit the crown, a visit to Liberty Island can be very rewarding. It's amazing to see the statue from Liberty Island and realize just how large it is. Ranger-led tours of the island are free and offer a great deal of information about the Statue of Liberty and its history. Of its approximately 22 million annual riders, roughly 1.5 million of the Staten Island Ferry passengers are tourists who take the free ride for the iconic New York views. Commuters and tourists get a view of New York Harbor and the Statue of Liberty during this hour-long ride between lower Manhattan and St. George, Staten Island. The Empire State Building is the most iconic and recognized symbol of New York City, and a visit to this legendary structure and its observation deck is a must. This classic New York City attraction gives millions of visitors each year spectacular views of New York City and the surrounding area from its 86th- and 102nd-floor observatories. The Empire State Building, which opened during the Great Depression in 1931, reflects its Art Deco era in its architecture and lobby. Buying tickets to the observation decks in advance cuts waiting time and is especially important if you're in New York City during high vacation season. More than 2 million works of art from around the world and throughout history are housed at the Metropolitan Museum of Art, the No. 1 art museum in the United States. If you're an art lover, the Met is well worth a visit to its vast and diverse collection. There's no way to see everything this museum offers in a single day, but just a few hours give you a taste of its most important gems. Founded in 1929 as the first museum dedicated entirely to contemporary art, the Museum of Modern Art is home to an impressive collection of modern works of art. From painting and sculpture to film and architecture, MoMA's diverse collection has something for just about everyone. Don't miss its gift shop, where you can buy classy souvenirs of your trip. Since opening to the public in 1869, the American Museum of Natural History has evolved and grown. In addition to the Rose Center planetarium and permanent displays, the museum hosts a revolving series of temporary exhibitions. This is a great place for kids, with IMAX shows and a Discovery Center that is full of hands-on activities for children. The food court and several cafes offer visitors a variety of different dining options and a chance to refuel during an extended visit. Grand Central Terminal is both an essential New York City transit hub and an authentic example of Beaux-Arts architecture. Renovations since its opening in 1913 have turned Grand Central into more than just a hub for transportation. You can shop, eat, have a drink, and just marvel at this architectural landmark of New York City. Its special spots, including the Campbell Apartment, Whisper Gallery outside of the Oyster Bar, and the Main Concourse Information Booth Clock, make this a particularly special destination, and it's all free. Central Park's 843 acres have offered a welcome escape from the concrete jungle of New York City since the mid-19th century, and 42 million people visit this green oasis every year. New Yorkers and visitors alike come to Central Park year-round to exercise, relax, and explore. One of the reasons that Central Park is such a magical place is that no matter how many times you visit, there's always something new to discover or explore. Visitors might enjoy a picnic in Central Park, watching a SummerStage concert or even taking a free walking tour offered by the ​Central Park Conservancy. Central Park was the first major landscaped public park in the United States and was designed by Frederick Law Olmsted and Calvert Vaux. The pair also designed Brooklyn's Prospect Park, somewhat smaller but also beautiful to behold and a star attraction in Brooklyn. Rockefeller Center is a great destination for visitors any time of year, but it's an especially big draw during the holiday season, with its famous Christmas tree and ice skating rink. Built during the Great Depression, the complex's Art Deco architecture and works of art make it destination-worthy, even without all the shops, restaurants, and activities happening. Besides its Christmas tree and ice skating rink, the midtown Manhattan landmark also offers visitors the wonderful Top of the Rock Observation Deck, where you can enjoy a great view of Manhattan from 850 feet above street level, and Radio City Music Hall, which hosts concerts, shows, and performances year-round. A walk across the Brooklyn Bridge from Lower Manhattan to Brooklyn Heights, across the East River, is such an authentic New York experience that it's often dramatized in movies and TV shows to set the scene. It's free and magnificent. Walk along the Brooklyn Heights Promenade on the Brooklyn side for spectacular views of Lower Manhattan and grab a hot dog from a street vendor on the Manhattan side of the bridge, just across from City Hall Park. Broadway, the Great White Way, is yet another NYC legend. The Theater District goes from West 41st to West 54th streets and from Sixth to Eighth avenues. It's home to 39 Broadway theaters, and for many visitors to New York City, this is a prime reason for going. Dinner and the theater is an authentic New York experience, and this is where you find it. Times Square, with its gaudy lights and legendary status, draws more than 400,000 people daily. It's one busy place, quintessential New York City for many visitors. The neighborhood has become more pedestrian-friendly with reduced traffic and more plazas with seating and tables for relaxing and people watching, as well as food carts where you can get a snack and drink to fuel up. Times Square is most impressive after dark when the glow of billboards and street signs make it hard to believe that it's nighttime. The 9/11 Memorial and Museum needs no introduction or explanation. The twin reflecting pools are in the footprint of the World Trade Center's Twin Towers that were attacked on September 11, 2001, and the names of all the victims of the attacks of that day, at the Twin Towers, in Shanksville, Pennsylvania, and at the Pentagon, along with the six who died in the 1993 bombing at the World Trade Center, are on bronze panels that form the edges of the two pools.